If you really want the power of texting in your hand with top of the line internet features and chatting add-ons then Qmobile Q8 Enigma WiFi is the device for you. To start on this device, the looks of this device are simply amazing. The body is sleek and made to be gives smooth handling to the device holder. The vivid large 2.4 inches TFT QVGA 320×240 screen with a complete QWERTY keypad just below it makes you stunned with its looks. Qmobile Q8 Enigma WiFi is a smart dual Sim mobile phone with GSM, GPRS and EDGE connectivity features. In addition, you can also use WiFi directly in this device and get connected with its Bluetooth. There is a smart little touch button just below the screen that enables you to navigate with excellent ease. The Qmobile Q8 Enigma WiFi comes with a 3.2MP camera and audio and video player that will keep you from changing your attention from this device. With Qmobile Q8 Enigma WiFi you can also listen to your favorite FM station and record the programs you like. Of course you will need a lot of memory space with this mobile phone this is why, the memory slot can support upto 32GB of external memory. Built on the need of socializers, Qmobile Q8 Enigma WiFi comes integrated with Yahoo messenger, MSN messenger, Skype, Google Talk, Facebook, twitter and of course YouTube. With the mini-opera browser in this device, you can navigate among your websites with utmost ease. This beautiful device does equally good on the battery also; it lasts around 248 hours on standby and just above 8 hours on talk time. The total music playtime ranges around 15 to 18 hours. If you really want a mobile phone that makes a social impression, Qmobile Q8 Enigma WiFi is the device. It is not everyone who wants to have a mobile phone that is loaded to entertain. There are many people with gray shades in their personality, who just want simple communication devices with basic communication features and Q Mobile E785 is just for them. In the previous years, Q mobile has developed some of the most amazing mobiles that show the artiste of its design lab and durability of its manufacture. The Q Mobile E786 Storm also falls in this range. Although it is a simple phone with simple features but it still is able to impress. Q Mobile is producing some of the best mobile phones that are durable, result oriented, multimedia loaded and in a low price as compared to other mobile device of the same class. 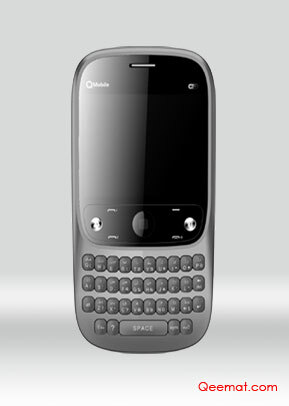 The Q Mobile E195 is another such mobile that offers everything that a high profile mobile phone has. I Want to sale my Q8 Mobile With 10 Month Warranty. can we use Skype on Qmobile q8? Does this mobile support java games and can we download games into it?? ?plz reply soon.